In 1978, Beer Advertising Openers, A Pictorial Guide by Donald Bull was published. This book pictured over 200 types of American beer advertising openers and classified them by type and category. A catalog of known American advertising pieces by type was included in the book. In the following year, Bull founded Just for Openers with the introduction of a quarterly newsletter. The purpose of the newsletter was to give beer advertising opener collectors a vehicle to broaden their collections and to keep a running catalog of new finds by type and by advertising. In less than a year membership had reached 200, a convention was held, and plans were underway for a meeting in the next year. In 1981, Bull published A Price Guide to Beer Advertising Openers and Corkscrews. By then over 400 distinct types of openers and corkscrews had been classified and thousands had been cataloged. Ed Kaye took over as Editor / Publisher of Just for Openers in 1984. 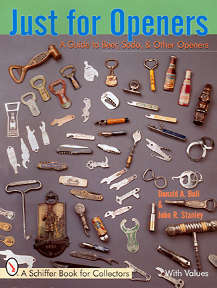 In the fall, Kaye and Bull published The Handbook of Beer Advertising Openers and Corkscrews, which pictured 500 types of openers and corkscrews with catalog listing of 9,000. After his five years at the helm, Kaye relinquished his duty to Art Santen. In his introduction to his first newsletter, Santen wrote "It would seem to me that everything that could be printed about openers has already appeared in Just for Openers (or has it)?" Santen quickly learned that was not the case and over the next five years, he published twenty issues of Just for Openers filled with new discoveries, catalog additions, anecdotes, member stories, annual convention news, and opener history. In 1994, John Stanley took on the Editor / Publisher responsibility for the very active group of opener collectors. John published several updates to The Handbook of Beer Advertising Openers and Corkscrews. By mid-1998, the number of distinct beer advertising opener and corkscrew types had grown to over 800. After a three hour Bull-Stanley trade session and a six pack of beer on a hot night in July, 1998, a plan was hatched, to write a new opener / corkscrew book. The combination of the Bull and Stanley collections and a call to collectors to supply missing types was needed to present in color all of the discoveries to date. The plan was to include only opener and corkscrew types that advertised a brewing company, a beer brand, a malt company, or a malt brand produced in the United States. Openers advertising companies that bottled beer for breweries, beer stores, bars, and saloons are excluded unless the type had a brewery, beer, or malt name. A section on general advertising openers and soda openers is included in the book after the beer advertising opener types. This is a brief introduction to the various "other" openers available. Different categories are shown with a concentration on unusual types and major brands of soda such as Coca-Cola, Pepsi-Cola, Dr. Pepper, Nehi, Orange Crush and Hires. Within categories, we have grouped similar types together while maintaining the original assigned alphanumeric designation. To help locate types by alphanumeric designation, there is a type index included in the back of this book.